Drought stress is a challenging abiotic stress for plants because of global climate change. Drought disrupts the normal transportation of solutes, causes electron leakage, and triggers the production of reactive oxygen species (ROS), which create oxidative injury. These ROS react with different cellular structures such as the nucleus, proteins, and membranes, impairing their integrity. Plants produce various molecular and metabolic changes, which allow the plant to survive under stress conditions. Plants initiate various mechanisms to maintain normal homeostasis of cells, such as enzymatic and nonenzymatic scavenging systems to protect cells from oxidative damage. These enzymatic and nonenzymatic scavenging systems are mediated by plants to detoxify the detrimental effect of drought stress. In this chapter we discuss the oxidative damage caused by water deficit conditions in plant and focus on the production and scavenging system of ROS in plants. We also provide details of ROS production sites and their reactions with different cellular organelles. Moreover, we provide a comprehensive discussion of enzymatic and nonenzymatic ROS-scavenging systems and their modes of action in neutralizing the harmful effects imposed by drought stress. Rapid activation of enzymatic and nonenzymatic ROS-scavenging systems mediates drought tolerance characteristics in plants. Genome-editing technologies should be employed to ensure that genes related to drought tolerance are used as the foremost step in breeding or developing drought-tolerant cultivars. 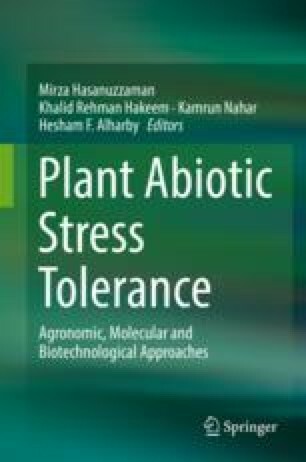 Enzymatic and genetic engineering are two novel strategies to develop tolerant cultivars that can mitigate the effects of oxidative stress.